One of the top teams in the country finds themselves at home in the West Coast Conference. Following a shocking loss over the weekend, the first one on a once unblemished Gonzaga record, the WCC will be marching ahead into the conference tournament. Time to find out if the Zags can overcome their first setback of the season. While we know the Bulldogs will be one of the top teams in the NCAA Tournament, whether that be a one or two seed, they are not the only team from this conference that will be playing come mid-March. St. Mary’s is another team that is pretty well locked into the Big Dance, but they will look to make that official by winning this conference tournament. Then we have eight other teams looking to burst someone’s bubble and claiming a spot that would otherwise go to a bigger conference team. On top of that, if Gonzaga does not win this one, they can very likely kiss that one seed goodbye for good. Things will tip-off on Friday, March 3rd. Once the bottom four teams finish up on day one, things will proceed with only one day off. That one off day will come on Sunday, March 5th, between the quarterfinals and semi-finals. This tournament will then wrap up on Tuesday, March 7th at 6:00 pm PT. You can check out the seedings and bracket below. So to kick things off, we have Pepperdine and Pacific going up against one another for the chance to take on the powerhouse Gonzaga. Let’s be honest, neither of these teams are very good, both sporting some key deficiencies. Luckily for Pacific, they have one or two less of those deficiencies, and they will come out on top 74-67. But no matter who comes out on top here, Gonzaga will roll to a win. Give me the Zags over Pacific 84-63. So who will be the lucky team to face off with Mark Few’s team in the semifinals, Santa Clara or San Francisco? Overall, San Francisco is the better team here when you look over the statistics as a whole. Their biggest flaw, free throw shooting. But I see them getting out to a comfortable enough lead to where those missed free throws will not come back to haunt them. San Francisco pulls this one out, 70-64. This conference has another team that is tournament bound. That team is St. Mary’s, and they will be awaiting the winner of the San Diego and Portland game. Looking over the numbers, my gut tells me to take Portland. The main thing that is going for San Diego is the fact that they throw up way more shots. So I will stick with the numbers my formula give me and take San Diego 72-68. But it won’t matter how many shots they take against St. Mary’s, as they are just going to get rolled over. Give me the Gaels 84-61. To cap off the quarterfinals, our three-six matchup will pit BYU and Loyola Marymount against one another. BYU is hands down the third best team in this conference, evident by their seeding and the fact that they are the only ones who was able to take down the Zags this season. They will be able to outperform Loyola Marymount, winning 78-72. Time for the semi-finals. 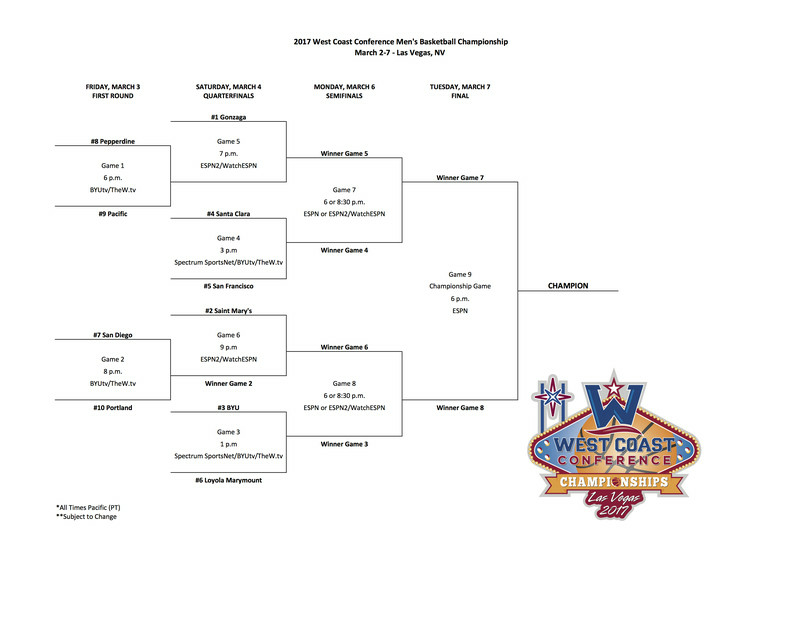 Gonzaga’s next step to a WCC title, San Francisco. There are only two teams that I could possibly see knocking off the Zags, and they are both in the next game. Unfortunately for San Fran, that means their journey will be ending here. Give me the Bulldogs by the score of 80-66. Next up, Saint Mary’s vs BYU in what could be one of the better games of the tournament. Yes, BYU is a threat. But when looking over Saint Mary’s numbers, they are as solid as they come across the board. They do not commit fouls, while also shooting free throws better. Saint Mary’s will simply be too much for BYU, pulling away late for a final score of 77-67. So when it comes down to the end, it is the two teams everyone will be expecting. An actual tournament bid is not on the line, since both teams will be in regardless. But seeding will certainly be impacted by the outcome of this game. In the regular season, Gonzaga had no issues of taking down the Gaels in both games they faced off with one another. So while this one will be competetive, the Zags will once again best their conference rivals. They come out on top 69-67 and hope that is enough to clinch a one seed. The Great Debate: Which Sport Reigns Supreme In America?